I will admit that this fish chowder recipe has an odd origin. You see, I’d made some simple farmer cheese, and a byproduct of cheese-making is whey, the acidic liquid that separates from the curds you make cheese with. True to my thrifty Scots ancestors, I didn’t want to just toss the whey down the drain. What to do? Oh, and if you don’t have whey around, no worries: Use white wine. Different, but still good. The easy way uses no whey and store-bought chicken broth. Or you could do a hybrid with whey and store-bought broth. It’s up to you. But, if you make this recipe my way, it is remarkably good. I say remarkably because I make a lot of chowder. The quintessential chowder to me is my mum’s Maine-style clam chowder, but I also make a Great Lakes chowder with Polish sausage and perch, and a salmon chowder that is very Pacific Northwest. I’ve eaten chowders all over the United States, too, so I am something of an expert on the subject. 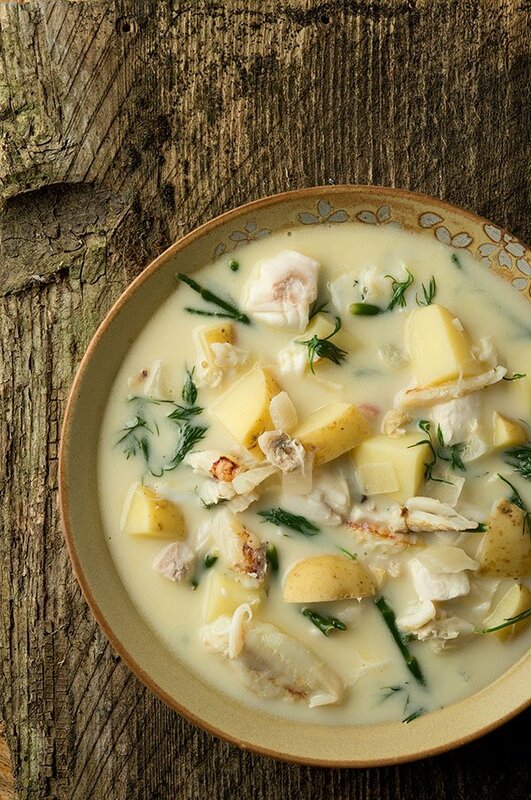 This fish chowder may just be better than my mum’s, which is blasphemy, I know. Why? The broth is a big part, but so is the choice of fish and the finishing touches, which I’ll get into in a bit. Yes, I know what you are thinking. Whey? Liaison? Sea beans? 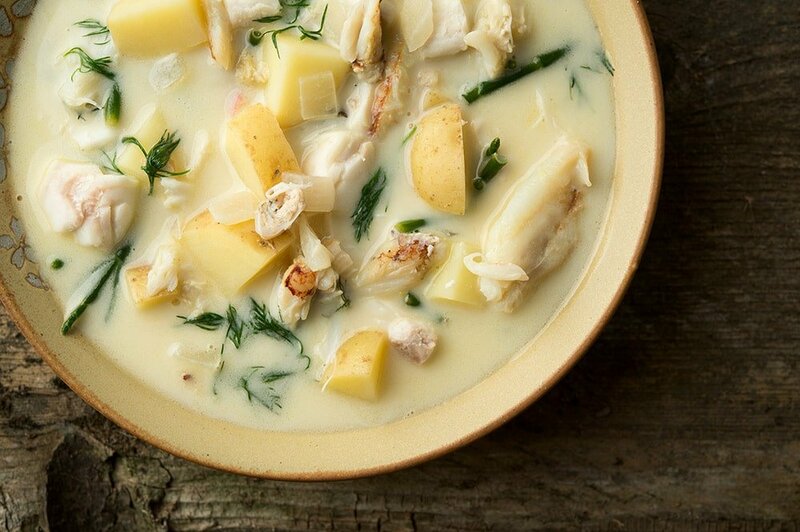 This is a pretty esoteric fish chowder. It is and it isn’t. If you can make this soup as I do, you will be astounded at how good it is. 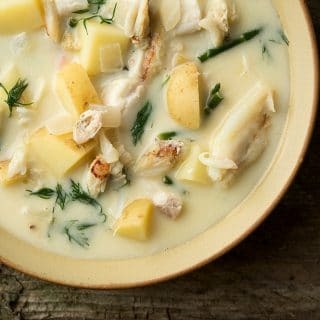 But even with much of the hard-to-find ingredients left out, it is still an excellent fish chowder to make, no matter whether you are on the coast or the Midwest. I’ll walk you through it. This recipe can be as esoteric or as simple as you want it to be. If you make it with homemade broth, whey and multiple kinds of fish and seafood, you may never make another chowder again. The next level down in difficulty would be to skip the whey and use white wine. Baseline is using chicken broth diluted a bit with the white wine and a bit of water -- you want a nice light broth, not a heavy, chickeny flavor -- but do not skip the egg yolk and cream liaison. Yukon gold or other yellow, waxy potatoes are key, too. Russets will dissolve. I use dill, but if you hate dill, use another fresh herb. Parsley, thyme, fennel fronds, lovage or marjoram are all good options. As for the fish, any firm, white fish works. I used lingcod. Try to add some other seafood, too. If you don't have crab and clams around, look for those teeny pink shrimp from Maine or Alaska, or bay scallops, or crayfish. If you are making the broth, do that first. Rinse your fish bones and heads under cold water. Remove the gills if they are still there; gills will turn a broth cloudy and make it bitter. Put the fish bones and other seafoody bits in a pot and cover with water by 1 inch. Bring to a simmer. Scum will rise to the top. Skim it off with a spoon. When the froth has subsided, drop the heat to a bare simmer, just a shimmy, really. Add the remaining ingredients and cook gently for 30 to 45 minutes. Strain and keep warm. To make the fish chowder, heat the butter in a soup pot and cook the onion over medium heat until it turns translucent. Don't let the onions brown. Add the potatoes and cover with broth by about an inch and simmer gently until the potatoes are tender, about 15 to 20 minutes. Add the fish and seafood, the sea beans and black pepper to taste. As these heat up, whisk the egg yolks with the heavy cream in a bowl. Using a ladle in one hand, and the whisk in another, slowly ladle some of the hot soup into the bowl with the egg-and-cream mixture -- all while whisking the mixture with the other hand. Repeat this two more times. What you are doing is tempering the egg yolks so they don't curdle. Add the contents of the bowl to the soup and stir to combine. Add the dill and let everything heat through, but do not let the chowder boil, or it might separate and look nasty. 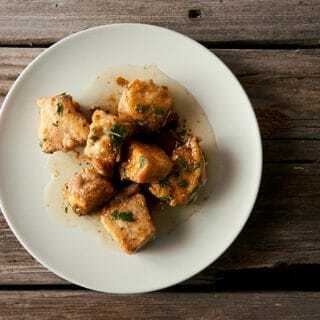 Serve with good bread and either white wine or a nice beer. This chowder doesn't keep well once you add the egg yolks and heavy cream. If you want to make a huge batch of this, make the broth and the chowder base with the potatoes and onion, and chill it. Then, when you want to serve, add the fish, dill and the liaison. You can find all sorts of fish recipes, freshwater and saltwater, on Hunter Angler Gardener Cook. Chad: If you can’t get sea beans, just use really skinny green beans. Not the same, but they’ll get ya close.